The table below shows the world's top performing currencies against the dollar. Poland, which was somewhat shielded from the Eurozone by its ties with the big neighbor to the east (considerable capital inflows from Russia and elsewhere in Europe) has been the best performer among the mainstream currencies. In fact Poland, together with other EU nations who stayed out of the euro area - such as Sweden, and the UK - have seen their currencies appreciate. 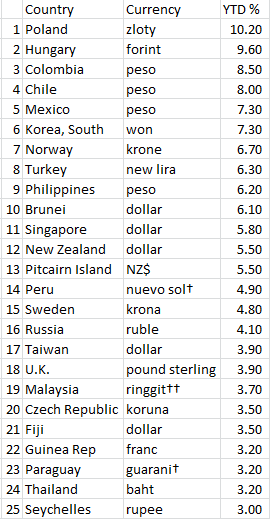 There is one currency however that has outperformed all of these by a long shot, but you won't find it on the list. The currency is called Bitcoin (ticker symbol BTC) and it more than tripled this year. It's not issued by a country, nor is it a precious metal or a rare-earth. Bitcoin is an electronic currency that can be exchanged for some goods and services, particularly online. The currency is not controlled by a central bank. Instead it is maintained by a global registrar and managed via a private network of participants who get paid to "rent" their computing power to the network. The "rented" machines are used to maintain the integrity of Bitcoin transactions and act as a virtual decentralized registrar. The network "node" providers (called miners) of course receive their payment in Bitcoin, with the overall currency amount growing gradually over time (current value of Bitcoins in circulation is about USD 140mm). The gradual growth in the "monetary base" is designed to prevent inflation. This is done via a complex algorithm that requires rapidly increasing computing power by the network providers to get paid the same amount. The number of Bitcoins paid to participants is halved periodically. At some point in the future the amount of Bitcoin will become fixed, with network providers relying fully on transaction fees rather than newly "minted" Bitcoins. For more background on Bitcoins see this story from Wired Magazine (Wikipedia does a terrible job describing this process). It is a brilliant scheme to create a global currency that is separate from governments and central banks. The network however has had its share of growing pains due to hacker activities (specifically on a major Bitcoin currency exchange - not the network itself) and regulators. But it has survived. The whole premise of this type of private network is to create anonymity online (see TOR Project). That means it is impossible to trace an online transaction. And therein lies the flaw of the Bitcoin concept: transaction anonymity attracts illicit activity. As an example, a website called Silk Road (you won't find it on the internet, since it lives on this private network) sells all sorts of things (paid only in Bitcoin), including illegal drugs. The site is estimated to have made some $22mm in the first half of 2012 but has received all sorts of scrutiny from law enforcement (for more on the site and the market, see the research paper from Carnegie Mellon). So why has the currency tripled this year? A number of rumors have been circulating in the online forums trying to explain the rally. Unfortunately one explanation that stands out is the increased demand for illicit drugs online. Quite sad actually. Another explanation is the fact that the number of newly minted Bitcoins has been halved again in November, reducing the available supply. Nevertheless Bitcoin is the 2012 winner for the best performing currency against the dollar.